No matches this week (anyone would think it was half term)... training for all will be on. 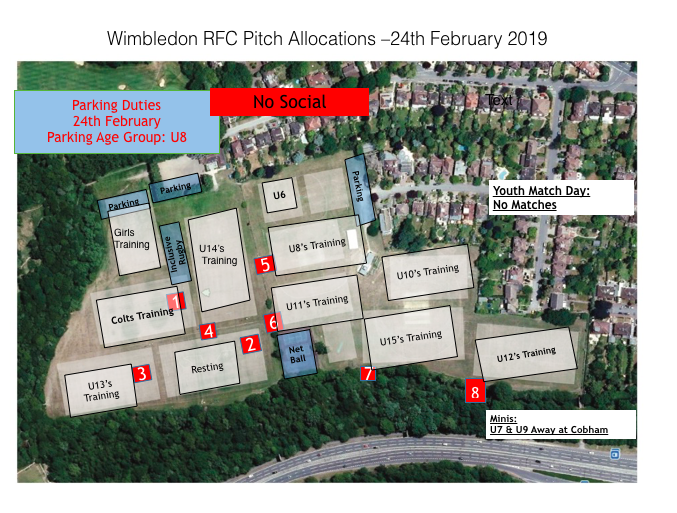 Under 8s are on parking this week. Please remember to avoid parking on Drax, Preston and Hood (particularly). There's a quiz night coming up on 15th March, 7.30 for 8pm prompt start. Organised by the social team from the minis, it's always a cracking night. Zoe and Frances have set aside tables for U6 to U11, Inclusive, Girls and Netball. Let's try and get at least one table for eight from each age group. Older groups and senior club members more than welcome. Friday 15th March, 7:30 for 8pm start. £10 per person, max. 8 people per team/table. Price includes cheese / biscuits / antipasti on the tables. Tables are to be paid for in full at the clubhouse. Perhaps age group managers could co-ordinate. Important: please ensure you complete the booking form too, so we know you've paid/how many tables are booked). No 1st XV at home this weekend (a good win last week keeps them in contention in the top three of the league) however there is a full host of Six Nations that the club will be showing on Saturday. It was a great atmosphere last weekend for the Sunday game so do head down to watch if you are looking for a venue. Another busy Sunday coming up. If you can support the adult 1st XV this Saturday (2pm KO at the club) there's an A3 derby against Guildford. The lads would appreciate any support you can give from the touchline. 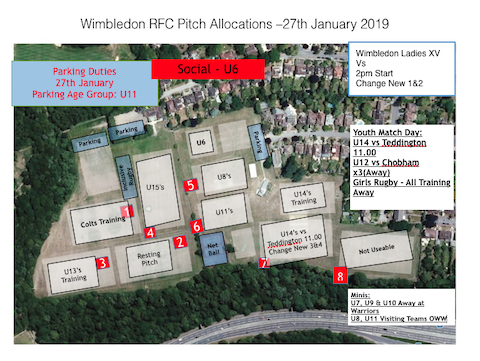 Moving on to Sunday, we have visiting teams from Kingston & Esher for the Minis and London Irish are visiting the U15s - welcome all. If you are visiting please park as per our parking policy and listen to our volunteers. And a reminder to everyone, if you are arriving after 0930 on a Sunday please do not attempt to enter Barham Road. Instead, park in one of the alternative sites on the parking policy. Talking of parking - it's the U11s on duty this weekend. Please remember to avoid parking on Drax, Preston and Hood (particularly). Paul Goss sends his thanks to all the coaches that attended the last meeting at the club. Lots of good ideas that he'll feed back to us all on and follow up. Thanks also from James Boatman who reports that the City Lunch last December was a huge success with a big boost to the club's coffers as a result. Will make a huge difference to the pitch maintenance budget (specifically repairs and an irrigation system) - thanks. There was the club quiz last Friday, hugely successful and won by the U9s with the Girls section as close runners up. Watch out for news of the Mini / Youth Quiz in mid March. Details to follow shortly. Everyone at home training for the first time in a while. Weather set to be cold this week so keep an eye on emails and here on the website. 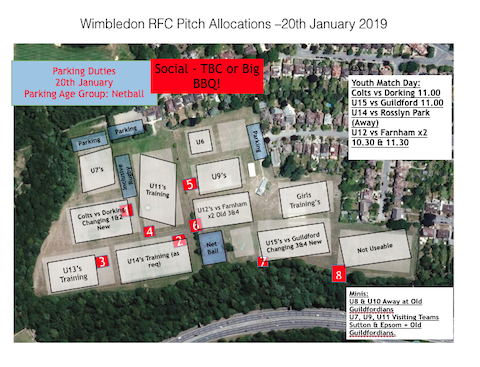 A big weekend of rugby this Sunday - welcome visitors from Guildford, Farnham and Dorking. With the grass now wet parking is at a premium. If you are arriving after 9.30am please do not attempt to enter Barham Road and park in one of the approved off-site locations. 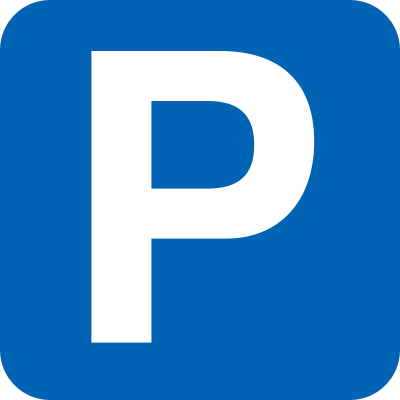 A reminder to all, club members and visitors to continue to show respect to the people who volunteer to park on a Sunday morning. These individuals (many of whose young children don a high vis vest to support their parents) are volunteers and under no circumstances should be abused of mistreated in any way. Car parking is a thankless but necessary part of club life, 100% reliant on the goodwill of volunteers. Most people have been moved around to accommodate matches. Please check, read and inform your age groups where they will be this weekend so there is not chaos to start the morning. Personally I would recommend arriving early for parking and set up. 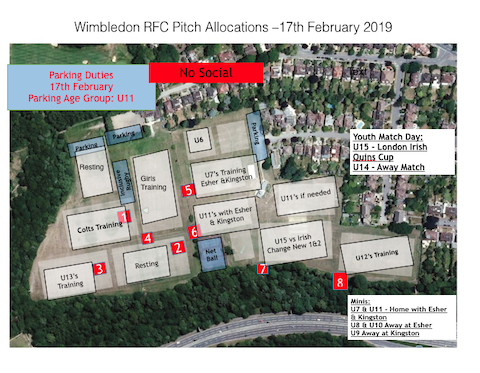 Here is the pitch plan for a busy weekend of youth matches. Trying to rest Pitch 2 this week. Welcome to our visitors from Reeds, Chobham and Warlingham. Please note changing rooms, food for U12 at about 1pm, the U13 & U14 after their 10.30 kick offs. Everyone's at home. 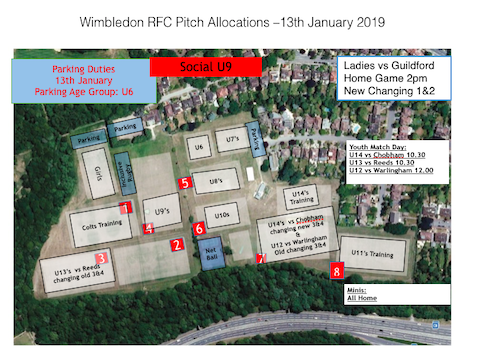 Pitch 8 (the one at the far left as you look from the clubhouse beyond the cricket nets) is back in action following some works by the grounds team. The U11s are going to give it a run out this week. Otherwise U7 on parking, U8 on cake sales and Shaun will have the BBQ fired up for bacon rolls and burgers/dogs. Have a terrific day of rugby all. Our annual sing-song and turkey festival is today! Please stay and enjoy the festivities - kids will get food for free and adults can buy some delicious festive favourites. Beer and wine on offer as well!!! A very busy day of rugby coming up this Sunday. Welcome visitors from Esher, London Irish, Chobham and Richmond. The BBQ will be fired up for bacon butties beforehand and burgers and 'dogs afterwards. 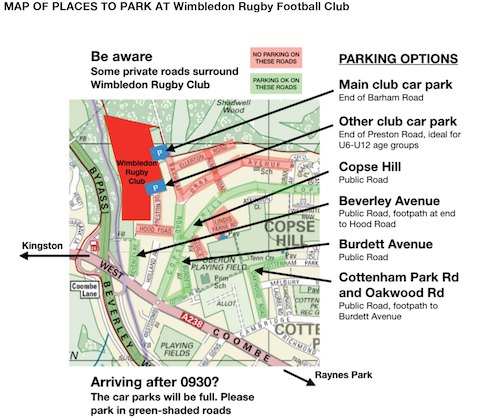 Wimbledon Rugby Club is located amongst a number of private roads so please do not park on any of the roads marked red on our parking policy and respect the parking marshalls and our neighbours rights to access. 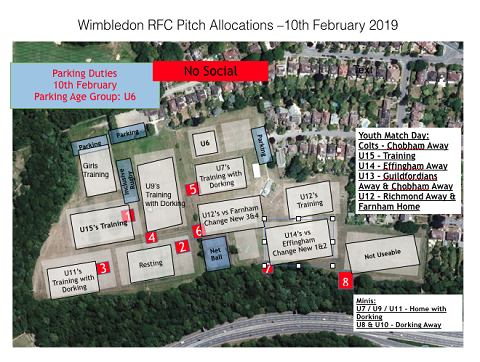 Whilst we are on the topic of parking, please note that the five parking spaces outside the front door of the club on Barham Road (the door that's never open, by the club sign) are reserved for parents with kids in the Inclusive Rugby section. Please don't park there. 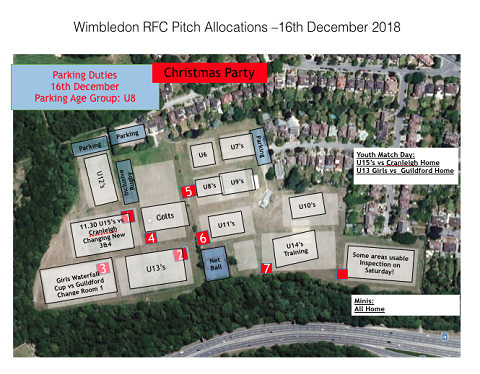 It's beginning to get muddy so to help us preserve the pitches for as long as possible could the U12s (on pitch 2) and Colts (on pitch 5) please use them carefully. U9’s can have overflow into the area between P7 and Netball - great size for a game there. 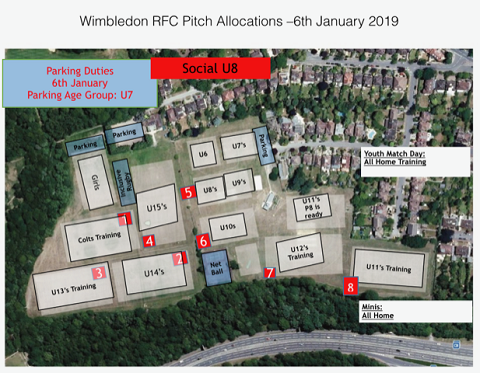 U7’s can overflow into their normal area next to U6’s as and if required. Our annual sing-song and turkey festival is next Sunday. Please stay and enjoy the festivities - kids will get food for free and adults can buy some delicious festive favourites. Beer and wine on offer as well!!! There will be a raffle (please bring prizes) and cakes and sweet stalls.